Now that everybody's got used to the concept of digital photography, those who make the cameras are realising that more of us have a penchant for taking better shots. So we need better cameras and are prepared to spend more on them. But not too much. A new breed of cheaper Digital SLR has sprung up over the last 12 months or so. As well as the Canon 450D announced today, there's also this new model from Pentax. 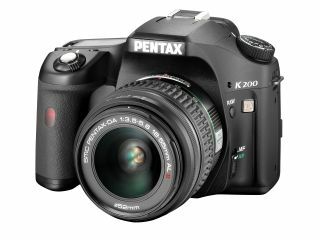 The K200D features a 10.2-megapixel CCD alongside Pentax's opto-magnetic Shake Reduction (SR) system. The technology uses two sensors to detect any vibrations and compensate for any movement. There's also some other pretty impressive features, with a 2.7-inch LCD, 11 point auto-focus, custom functions and a plethora of picture modes. SD and SDHC memory cards are supported as are Pentax's K series of lenses. £580 is the recommended retail price, but expect to see it hit the street in March for less.